Hello, hello my name is Dr. Echo Rivera and if you’re new to my website, this is where I share ideas (and provide training & services) to help academics, researchers, and scientists can communicate their work more effectively & creatively. If you like the sound of that then sign up for the Communication Cafe, it’s my free email list and that’s how you find out about new content and get invites to my special training events. I do have the show notes posted here, but I strongly recommend that you watch the video so you can see what’s possible using basic slide software—you might be pleasantly shocked! Okay, let’s get started. If you are alive, then your social media account is probably buzzing with people’s reactions to Marie Kondo’s new Netflix show, Tidying Up. We’re in the middle of the first season and it seems like just about everyone else is, too. And whatever you think about her approach, you have to admit that it’s really getting people to talk about our stuff. What’s funny is that the first episode of this show is really my first experience with the KonMari method. But, from what I gather, she’s been pretty famous for a while? I’m grateful that she has a show because now I, too, am familiar with her work. And after the first couple of episodes, my mind made an interesting connection. I realized that her method applies to presentation slides. Her method to help you tidy up your home is very similar to the framework I use to train folks on effective presenting. So i wanted to make this fun video. It’s really lighthearted, nothing too serious, but hopefully it sparks (*howls* see what I did there!) some insight in you. Let’s get started. These are the rules from her website, and I made them a little more presentation friendly for this. This is an excellent starting point for just about any major change you’re going to make in your life. Yes, learning how to present effectively could be a major change for you. It’s NOT just about learning some more powerpoint or graphic design skills…but I talk more about that later. So this is really easy one. If you want to present more effectively, then make the commitment. Again, i love this. It’s essentially goal setting but in a more effective way. Once you can see the future you want and live in, even if just imagining it, that can keep you highly motivated when you get stuck or overwhelmed or frustrated. How do you feel when you are presenting? Do you feel like you’re fighting your audience for their attention? That you’re boring them or confusing them? Whatever it is that you feel, ask yourself: Are you happy with that feeling? If not, what do you WANT to feel instead? For example, if you feel like you’re boring or confusing your students and peers … how much better would it feel if you felt like that were really WITH you and following you and FOCUSING on you during the whole presentation? Whatever you come up, hold onto it and use that to help you get through the moments where you get overwhelmed or frustrated. I think writing it down would also be really helpful, so you don’t forget. Oh my COFFEE this rule is what really sold me on the idea to do this video. Marie Kondo starts with getting rid of the excess stuff in your home. Which is exactly where we start with my presentation design training. 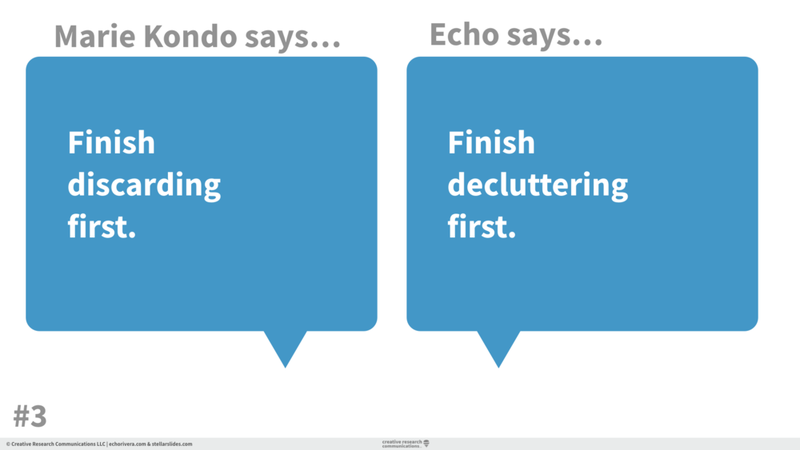 One of the first things you learn to do is how to identify clutter in your slides and how to start getting rid of it. Side note: If you’re tidying up your house and have a lot you want to get rid of, be sure to do it responsibly and don’t just dump everything in a landfill. And make sure to address your overconsumption habit for the future. Luckily, with slides, we don’t have to worry about that. You can delete things off your slides without any worry or guilt, because it’s all digital. Whoo hoo! Yesssssss. This is so smart because she starts with the easy stuff, the stuff that’s not going to get you stuck. The changes that will help you gain small wins and stay motivated throughout the process. And, most importantly, the strategies that help you hone your skills to know what to keep and what to discard. I follow a very similar approach when I train people how to improve their presentations. We do it by category (I have a whole framework) and we start with the easy things, like getting you STOP USING A TEMPLATE! Because, when you stop using a template and do other design strategies instead, you see instant improvement. Not only is that highly motivating, but you also start to see all the other ways you can improve your presentations. Starting small opens the door to more change. And then each of Marie’s categories become harder and harder, and that’s exactly how i train people to do their presentation re-design. The hardest strategies, the ones that kinda freak people out at first when they learn about it, those are the ones i suggest people save for last. And it works. So what gets me about this is when i started my business a couple years ago, I decided to sign all my Communication Cafe emails with “with joy.” I made a decision early on that my approach would be non-shaming and non-judgmental, and that I would try to bring joy to every single person in my audience. So, it totally cracks me up that her thing is all about joy too. I mean how perfect is that. Speaking of the Communication Cafe, don’t forget to sign up because it’s the primary way I communicate things like free and paid training events and new resources. Anyway, this rule also applies to how I teach presentation design because I’ve said sooo many times that it should be FUN to work on your presentations. 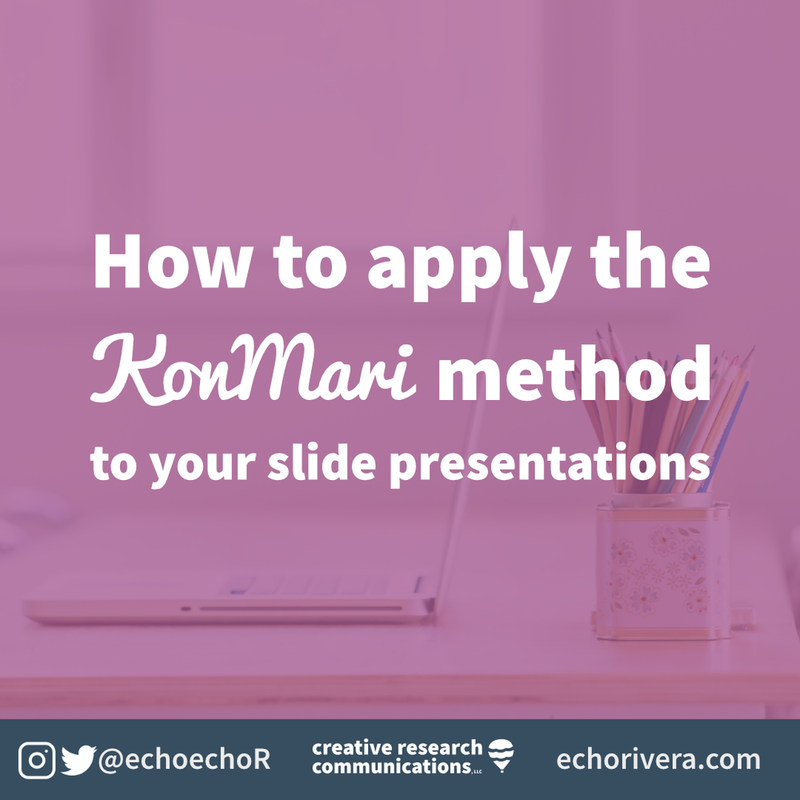 You should ENJOY giving presentations! (Yes, that’s possible even if public speaking scares you and you’re nervous. You may have already heard me talk about how I used to be TERRIFED of public speaking—it was so bad that I used to puke before a talk). But now — thanks in part because I learned how to ENJOY creating a presentation — I have a lot of fun with it. I can’t tell you how often I create a slide, and then just burst out laughing because what I did was sooo funny and I get EXCITED about sharing it with my upcoming audience. YES, you should be laughing at your own jokes. >> FYI — that happened with one of the gifs I used in this video. Which, again, is why you should WATCH IT instead of just reading this! That’s how it should be. And if it’s not, then you and me — we need to change that. Together. Speaking of which…I have 2 bonus lessons to share with you, based on watching the show. So, again, these are just some extra insights that came from watching the show. A couple times, Marie Kondo has said something along the lines of “This isn’t about surface level cleaning” … it’s about imagining the ideal type of lifestyle you want to live, and changing how you live …. something like that (very loose quote, I didn’t write it down because I was stuffing my face with spaghetti). This idea still works PERFECTLY when applied to effective presentation design, because I’m constantly reminding people that what I teach is NOT JUST ABOUT PRETTY SLIDES. Yes, that’s part of it. But it’s a smaller part than you think. What I teach people is an entire framework on visual slide-based communication. The other connection I made isn’t about anything she said or a rule she has. It’s about the show in general. The subtle lesson you might miss when watching the show is that training and support is incredibly valuable. I’m willing to bet a couple cups of coffee that most (if not all) the people on the show have read her book. I’m also willing to bet that many of my viewers and readers have read a book about data visualization, effective presentation, or communication. Which…is fine. There’s nothing wrong with that. But I’m curious…have they gotten you to where you want to be yet? If the answer is yes, awesome! I’m super happy for you. But if the answer is no, then it’s probably a similar reason why the people on Marie Kondo’s show still had messy, disorganized homes even after reading her book. When you DIY entirely, there’s no real accountability. There isn’t any pressure or external motivation to keep you going. Just knowing that Marie Kondo was going to come back and look at their process is probably one of the key reasons that they actually completed the process. And having her there, to answer questions about how her general tips apply to X specific thing also helped them get unstuck. Some people can do DIY and that’s all they need. That’s why I have a DIY workshop series because, for some, it’s all they need. But that doesn’t work for everyone, and is why I have a comprehensive group mentoring program and why I offer Training & Technical Assistance sessions. Because sometimes, having someone there to answer your questions and help get you to the next level is what you need to achieve your goals. Oh, and don’t leave without following me on: Twitter, Insta, YouTube, LinkedIn, or Facebook.